How to convert Hexadecimal number to Octal number in Java? 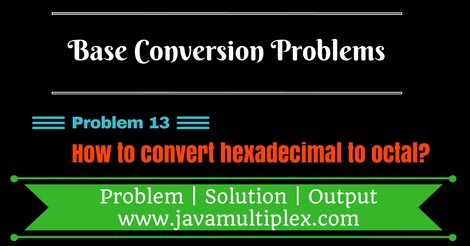 Home Base Conversion Conversion Problems How to convert Hexadecimal number to Octal number in Java? Write a program in Java that converts Hexadecimal number to Octal number. For converting hexadecimal number to octal number. First, we have to convert hexadecimal number to decimal number and then decimal number to octal number. How to convert Hexadecimal number to Decimal number? How to convert Decimal number to Octal number? // Converting Integer to String and adding into StringBuilder. // Reverse String using library function of StringBuilder class. // Converting String to StringBuilder. Output - How to convert Hexadecimal number to Octal number in Java? Tags : Conversion problems, Hexadecimal to Octal, Solution in Java, String, StringBuilder, Regular expressions, switch statement, for loop, while loop, if else statement.